If you need to perform a manual installation because the automatic installer does not work, follow this procedure. CAUTION: you will need to repeat this procedure every time you upgrade the add-in. 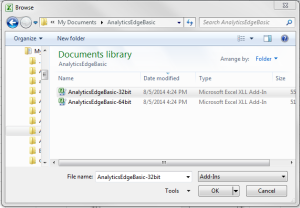 Download the file AnalyticsEdgeBasic.zip for the free Basic Add-in, or the file AnalyticsEdgeStandard.zip for the Standard Add-in, or AnalyticsEdgeCore.zip file for the Core Add-in. 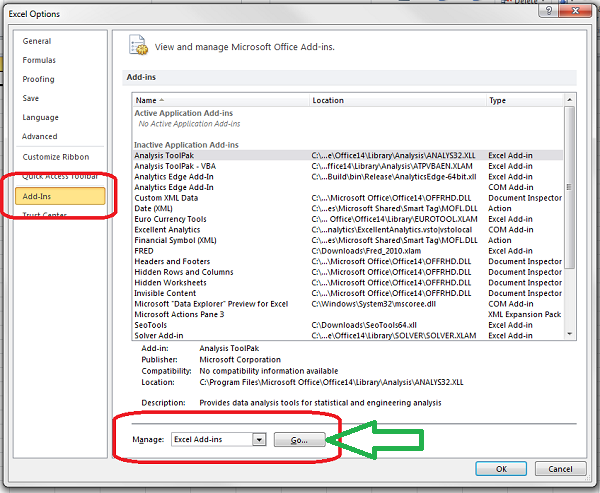 Extract the files to a folder on your hard drive (right-click and select Extract All… from the pop-up menu). If you want to share the add-in with other users of the computer, make sure to put the files into a folder that all users can access. Do NOT use the Program Files or Program Files (x86) folders — Windows protects these folders. If you want to use the same folder that the installer used (maybe from a previous installation), open the Windows File Explorer and type %appdata% in the address bar. Then navigate to AppData > Roaming > Microsoft > Addins. This is the default installation folder. Open Microsoft Excel 2007 or higher on your Windows computer. 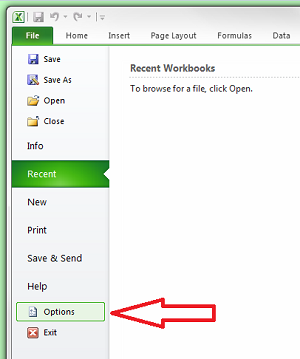 Open the Excel Options (File – Options) dialog. Click the Browse… button. If you used the default installation folder, you should see the Analytics Edge Add-in listed already – just check the entry and click OK. 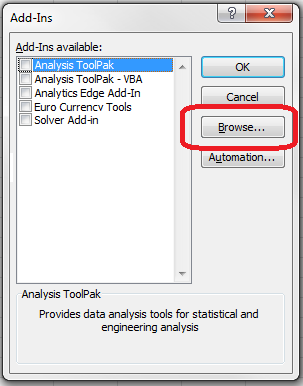 Locate the files you unzipped in step 2 and select the version of the add-in you want (Basic Add-in: AnalyticsEdgeBasic-32bit.xll or AnalyticsEdgeBasic-64bit.xll; Standard Add-in: AnalyticsEdgeStandard-32bit.xll or AnalyticsEdgeStandard-64bit.xll ; Core Add-in: AnalyticsEdge-32bit.xll or AnalyticsEdge-64bit.xll ). NOTE: only one version will work depending on your installed Excel version (32-or-64 bit) — If one does not work, try the other. Click Open, and click OK to close the dialog. 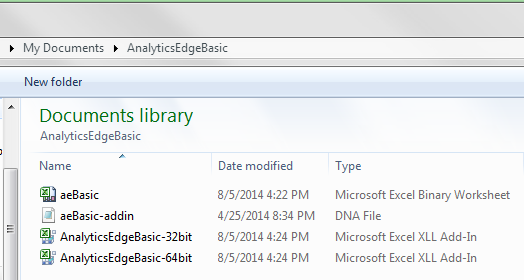 The Analytics Edge ribbon should now appear when you open Excel.